Ramdan, the annual fast for Islamic religion is going on all over the world which normally falls from mid-May to mid-June. For Muslims, Ramadan is the most sacred month of the year and each Muslim fasts every day from sunrise to sunset. They abstain from eating any food, drinking any liquids, smoking anything from sunrise to sunset. The only people that do not have to fast during Ramadan are children, the elderly, pregnant women and those who are travelling or who are ill. The reason why Muslims fast is because it is one of the Five Pillars of Islam, the other pillars being faith, prayer, charity and making the pilgrimage to Mecca – the Holy City. During Ramadan, Muslims wake up well before dawn to eat the first meal of the day, which has to last until sunset. This means having a meal (suhoor) with lots of high-protein foods and drinking as much water as possible right up until dawn, after which they can't eat or drink anything. And after evening prayer, they break their day's fast with a light meal followed by a larger meal (if-tar). After one month of fasting, finally they celebrate the end of Ramadan with the festival of Eid al-Fitr which literally means 'festival of breaking the fast'. This year, Eid al-Fitr is expected to fall on the evening of 14th June or on the evening of 15th June, depending on the sighting of the crescent moon. 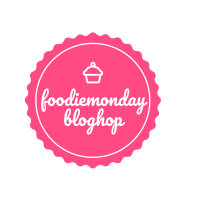 Since the festival is approaching, so the Foodie Monday Blog Hop team has come up with the 148th theme as 'Eid Special' to celebrate the occasion. The foods eaten to mark Eid vary across the world and there is no traditional set menu till now. Both sweet and savory dishes are consumed starting from biryani, lamb kebabs to rice puddings, baklava and many more. Here I have prepared a no-cook dessert using apricot for the theme contribution as 'Apricot Truffle'. Apricot, the yellowish-orange fleshy fruit tastes both sweet as well as tart. Apricots or Khubani (in Urdu language) can be consumed as raw or in dried form as well. Most of the times, we are familiar with the dried version of apricot, because these fruits don’t last for more than a few days and hence they are dried to keep them consumable. Apricots contain an impressive list of minerals and vitamins like A, C, E, potassium, manganese, magnesium, phosphorous etc. They are also a good source of fiber. Actually they have numerous health benefits starting from treating digestion, reducing cholesterol to aiding weight loss and treating respiratory conditions etc. Apricots are used in various kinds of preparations like jams, juices, jellies and a variety of sweet dishes. I have already prepared a dessert using the dried apricot as 'apricot pudding trifle' in my blog before. 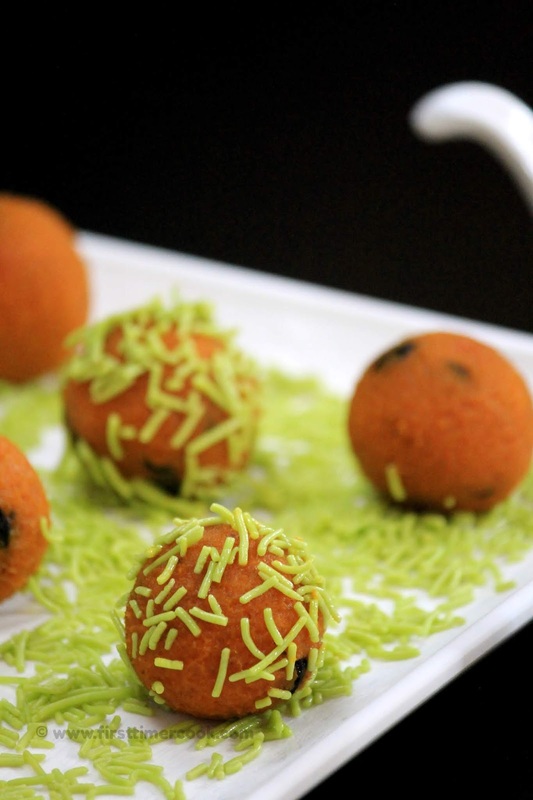 Well coming back to the dish, here I have used some desiccated coconut along with pitted apricot to make the truffles. These truffles are so good and take only 10 minutes to prepare. It is a simple no-cook recipe. Just blend everything in a blender jar and make balls. Also these can be packed for kids snack box and will be a best in-between-hunger-pang-pick-up. 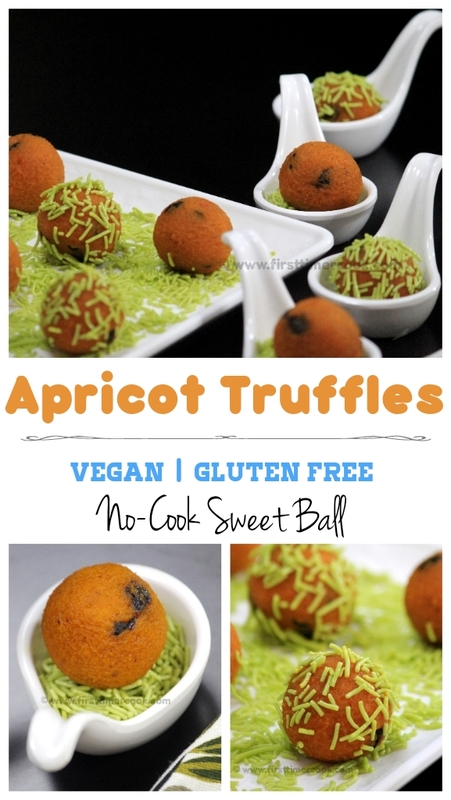 These apricot truffles are completely vegan and gluten free. In a bowl first soak the pitted apricots for 2-3 minutes along with warm water. Then roughly chop those soaked apricots and keep aside. In a blender jar take desiccated coconut, roughly chopped apricots, lemon zest, lemon juice and salt. Pulse with an interval of 10-12 second until a dough like texture is formed. 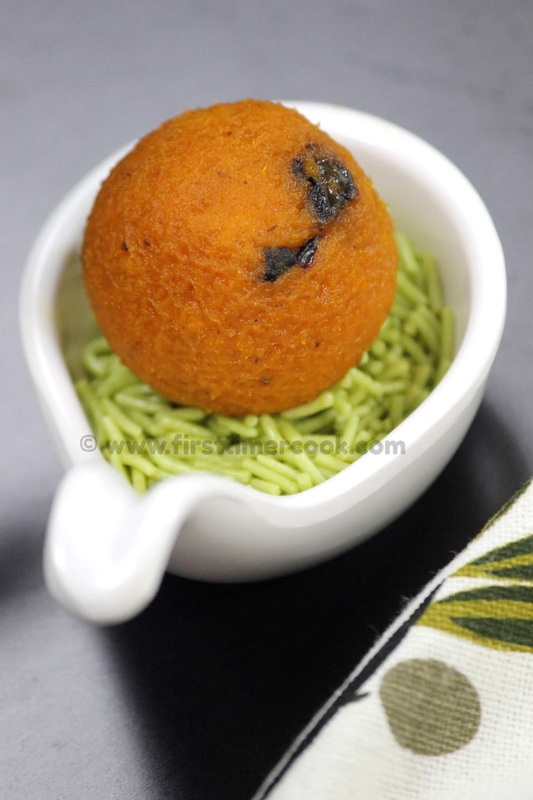 Transfer to a plate and start making balls of 1-2 inch size. In another plate take some sprinkles and roll each ball over these to get well coated. Refrigerate in an air tight container to firm well and then serve !!! Do not over process everything for long, otherwise a paste will form and the balls cant be shaped easily. Fresh grated coconut also works well if desiccated coconut is not available. Always prefer to finish within 1 day if stored at room temperature and within 4-5 days if refrigerated. Addition of black raisin is completely optional, can be omitted too. Any other dry fruits can also be added. 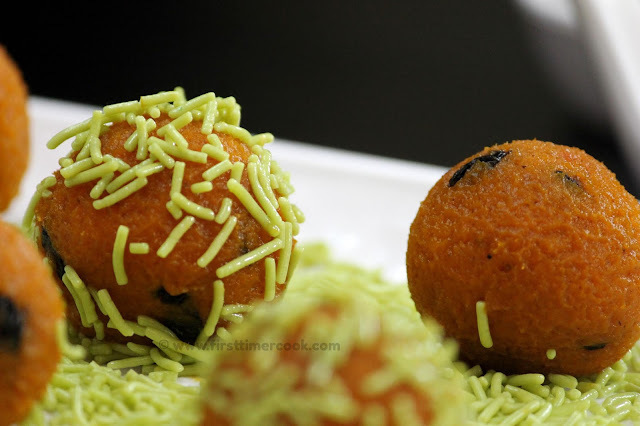 The no cook apricot coconut truffle look so inviting Sasmita ! 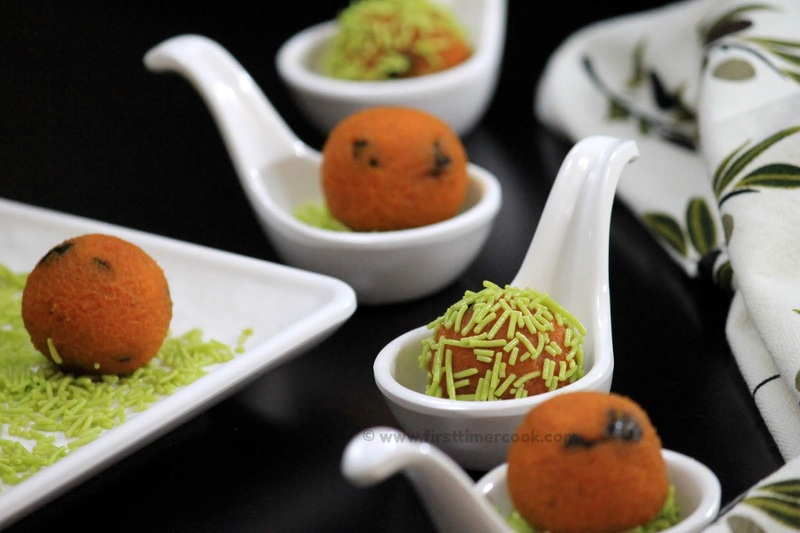 Drooling here Sasmita!The truffles look absolutely divine! Trifle looks delicious. Your pictures are drool worthy. Thanks for the easy, quick and healthy recipe. Lovely share. Firstly, I absolutely love the colors playing together in these pictures! Orange and green..so lovely! 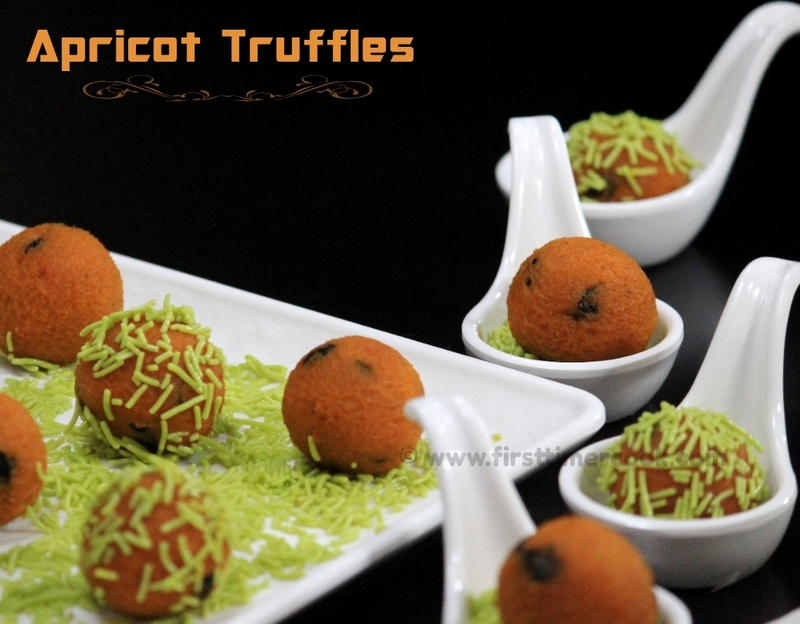 secondly, everything about apricot truffles sounds lip smackingly yummy! Love it! These truffles look fabulous Shamita. I am sure they would tasted delicious. These truffles look so beautiful. Love the contrast of orange with green. Easy to make and healthy too, just the kind of Kid treat for all. Wow.. such a beautiful presentation of delicious truffles. A total new dish to me. clicks are just amazing, Loved your detailed post. Truffles look delicious,easy to make and so tempting.bookmarked! Wonderful one sasmita, it looks so good, i do need it now. Prefect looking truffles, how awesome its looks. 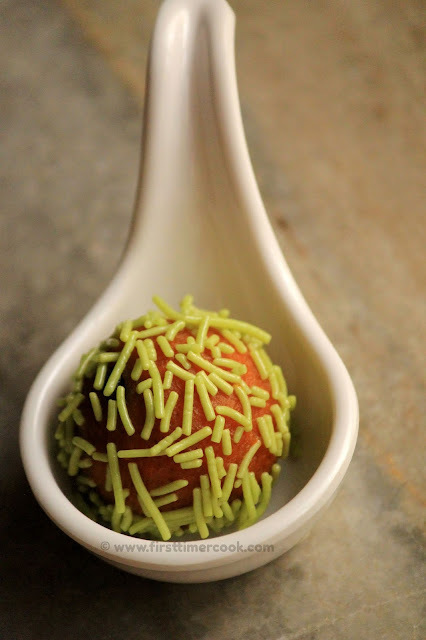 Cant take my eyes from your clicks..
Small small cute truffles looks incredible. Loved your detailed recipe. Apricot truffles looks like a very healthy and tasty and totally guilt free as well. Wow! What a delicious treat!! Love that golden color! A perfect treat for parties! While I was scrolling down, I was literally drooling. What a good idea to use apricot like this.